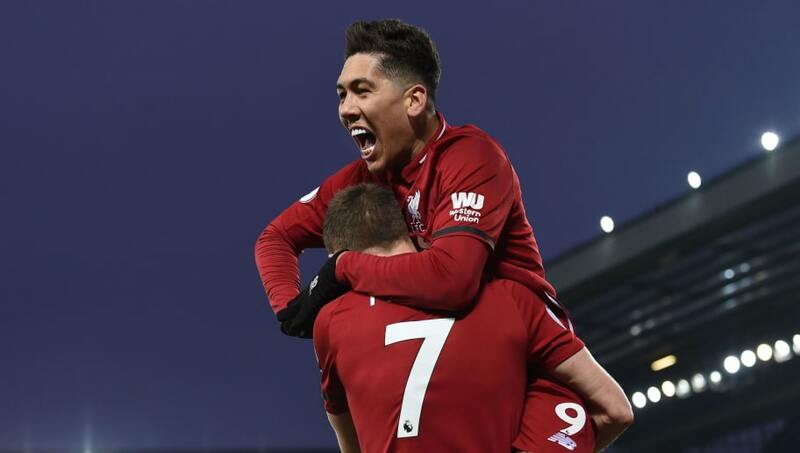 Liverpool extended their lead at the top of the Premier League table as they saw off a determined Crystal Palace side in a frantic end-to-end encounter at Anfield. The hosts started brightly but Palace took the lead when Wilfried Zaha burst past James Milner and pulled the ball back for Andros Townsend to power home emphatically, leaving Anfield stunned with the game approaching half time. ​Liverpool came flying out of the blocks following the break as Mohamed Salah volleyed beyond Speroni from Virgil van Dijk's deflected strike to restore parity minutes after the restart. Klopp's men showed no signs of letting up as Roberto Firmino worked some space and saw his deflected strike bobble into the corner to give the Reds the lead. James Tomkins then rose highest to head home and bring the scores level with 20 minutes left to play to set up a grandstand finish, only for Salah to show his predatory instincts again when he nudged the ball over the line after Speroni failed to deal with a tame James Milner cross. With minutes remaining, Milner was dismissed for a second bookable offence before Sadio Mané finished from a tight angle to send Anfield into raptures. Conor Wickham and Max Meyer then combined to net a further consolation for the visitors, capping off an enthralling encounter. Check out the roundup from Saturday's game below. Klopp will undoubtedly be relieved to have emerged from another hard-fought contest against ​Crystal Palace with all three points and will no doubt point to his side's qualities to fight back after going behind. The German will still be concerned by the manner in which his side conceded both goals against a Palace side that consistently troubles his side. Palace capitalised on Liverpool's exposed backline to take the lead in the first half, while Tomkins was allowed to ghost into space to head home his side's second. Klopp will know that eliminating basic defensive errors will be crucial in maintaining his side's push for the title, even if the Reds' backline has been brilliant for the majority of the campaign. Starting XI: Alisson (6); Milner (5), Van Dijk (6), Matip (5), Robertson (6); Fabinho (6), Keita (5), Henderson (7); Salah (7), Firmino (6), Mané (5). Substitutes: Shaqiri (5), Camacho (N/A). STAR MAN - ​Jordan Henderson impressed in midfield for the home side as he consistently snuffed out Palace's attempts to counter attack. Often criticised for being overly cautious in possession, Liverpool's captain looked to use the ball effectively and displayed his range of passing with pinpoint switches of play throughout. WORST PLAYER - Naby Keita's performances for Leipzig prior to his arrival on Merseyside were nothing short of sensational. However, the Guinea international's showings for Liverpool so far have been disappointing and disjointed; again the nippy playmaker was ineffectual out on the left of Liverpool's midfield and was lucky to go unpunished after a nasty challenge on Townsend before the break. Despite the result, Roy Hodgson will take great pride from his side's efforts against this season's standout performers. Having taken points off Manchester City, Arsenal and Manchester United this term, the Eagles boss will be frustrated by his side's inconsistency against those around them in the league. Hodgson's players are clearly capable of lifting themselves for the big games and will need to find a way to motivate themselves for games against lesser sides if they are to finish in the top half of the table. Starting XI: Speroni (5); Wan-Bissaka (6), Tomkins (6), Sakho (6), Van Aanholt (5); Milivojevic (5), Kouyaté (6), McArthur (7); Townsend (6), Zaha (8), Ayew (5). Substitutes: Schlupp (5), Meyer (6), Wickham (5). STAR MAN - Zaha probed and tested Liverpool's defence whenever the opportunity arose. The Ivorian gave James Milner a torrid time as he exposed the makeshift full back's age with his trickery and fleet of foot on numerous occasions. Hodgson will want to see more of the same from his talisman in the latter stages of the season. WORST PLAYER - Speroni impressed when called upon in the first half and also distributed the ball well from the back. However, for all his good work in the first half, the Argentine's howler that handed Liverpool their third cannot be excused, even at the age of 39. Liverpool have a lengthy break to enjoy before they take on Leicester City in the Premier League on January 30, while Crystal Palace take on Tottenham at home in the fourth round of the FA Cup next weekend.